Over the past 100 years the Bulldog has gone from a great athlete to one of the unhealthiest breeds around. And despite numerous concerns about their health & overall well-being they continue to rise in popularity. And the problem, of course, is completely man made. We’ve bred Bulldogs to be extreme; we shortened their snouts and legs, increased the size of their skull, and of yes, we’ve even made their underbite a desirable feature. But when it comes to the welfare of the breed itself we need to ask ourselves: what has unethical breeding done to Bulldogs? We all know the Bulldog; with their stocky build, flat face, and underbite they’re one of the most recognizable breeds. And what once used to be a healthy, athletic dog is now a short, stocky breed plagued with health problems. 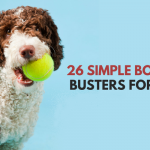 Despite numerous health concerns they’ve gained a lot of popularity amongst dog owners, rising from the 16th most popular AKC registered breed in 2003 to number 5 in 2014. 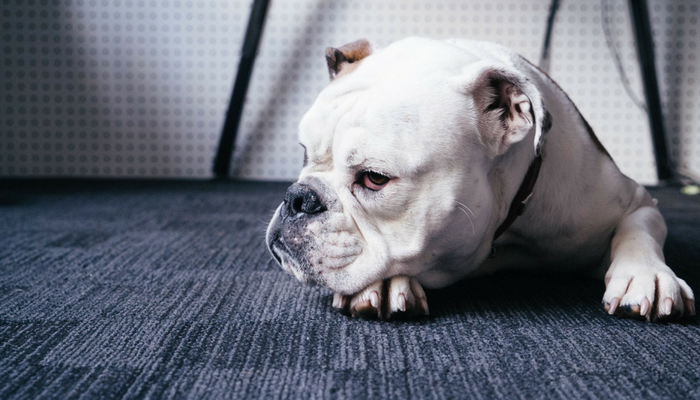 And while Bulldogs make wonderful companions personality wise, the numerous health problems that plague the breed have left many owners heartbroken. To some the Bulldog is an adorable barrel chested companion, to others they’re the poster child for what’s gone wrong with dog breeding. Commonly referred to as the English Bulldog the term “Bulldog” can be traced back to the year 1568. They were originally bred in England to help control livestock. The dog became widely used in the sport of bull baiting; dogs would be set onto a tethered bull and whichever dog brought the bull down would be declared the winner. The sport gained a lot of popularity but it didn’t last. Baiting was made illegal by the Cruelty to Animals Act of 1835. Dog show enthusiasts wanted to preserve the breed and decided to selectively breed out the aggressiveness of the original Olde English Bulldog. After the outlaw on baiting many Bulldogs were exported to the United States & Germany. In Germany they were crossbred to eventually create the Boxer. In the United States they continued to work at herding livestock. Over the years the Bulldog’s physical traits have been bred to be more extreme. The face has become flatter, the legs have shortened, the head has grown larger, and the underbite has grown. These changes have been made to give the Bulldog a more expressive face, emulating the look of a human child. It’s these extreme changes that have led to the many health problems facing the Bulldog today. And unfortunately new research suggests that improving their health at this point would be difficult due to their lack of genetic diversity. Most Bulldogs can’t breed without human intervention, both in the actual mating & birthing process. If it weren’t for this intervention in breeding the Bulldog as it stands now would become extinct. As many as 95% of Bulldogs are delivered by Cesarean section. Their head has been bred to become larger over the years, and as a result these dogs cannot birth them naturally through the pelvic canal. 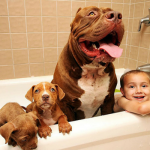 The Bulldog has numerous health concerns, and I’m sure many Bulldog owners can sympathize. The annual veterinary costs for a Bulldog are twice as much as those for a Labrador Retriever. They have problems with their breathing and respiratory systems due to the enlargement of the soft palate and narrowing of the oropharynx. They’re also known for problems with their heart, hips, eyes, and skin. Bulldogs are extremely intolerant of heat due to their short snouts. 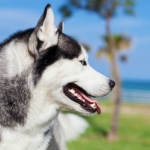 They’re unable to regulate their temperature through panting as well as other dogs, and even normal activities in intense heat can cause heatstroke. It’s recommended that Bulldogs be kept in an air-conditioned area with limited trips outside when the temperature is over 80 degrees F, or when the humidity is high. They have the highest rate of hip dysplasia in any breed. A study released in 2009 by the Orthopedic Foundation for Animals found that 71.6% of the 564 Bulldogs they studied were affected. A 2004 study from the Kennel Club found that the median life expectancy of a Bulldog is less than 7 years but a more recent study from UK vet clinic data puts the median at 8.4 years. Birth defects, such as flat chests, have led to high puppy mortality. In 2008, BBC One aired a documentary called “Pedigree Dogs Exposed” which looked into the health and welfare of pedigree dogs in the United Kingdom. 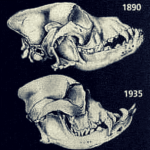 The film spawned three independent reports that all found that breeding for “extreme traits,” like the massive and short-faced head of the bulldog are detrimental to the health and welfare of the dogs. The program stated that most Bulldogs are unable to give birth naturally because their heads have become so large. The film didn’t just focus on Bulldogs, they highlighted some drastic changes in other breeds such as the Pug, German Shepherd, Basset Hound, Bull Terrier and Dachshund. It’s not the greatest quality but you can find the full film on vimeo. The BBC released “Pedigree Dogs Exposed – Three Years On” in 2012. 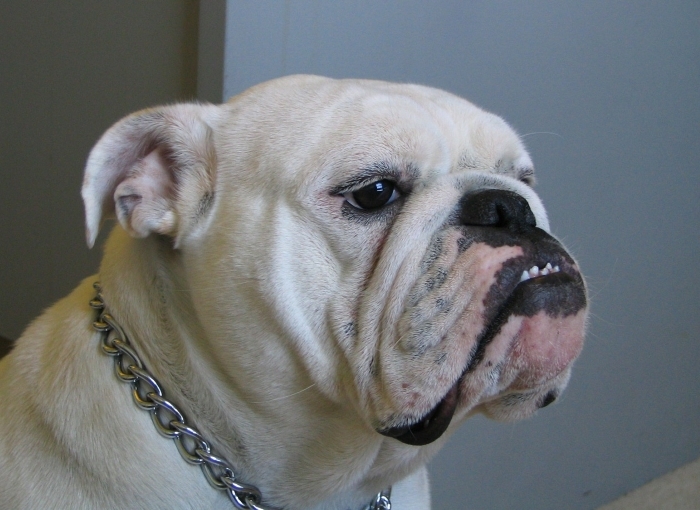 The British Kennel Club issued new standards for Bulldogs in 2009. The new standard calls for a “relatively” short face, “heavy, thick-set, low-swung body,” a “very short” face and muzzle and a “massive” and “undershot” jaw. The standards were issued to create a healthier and leaner Bulldog. The Bulldog Club of America owns the copyright to the American standard and doesn’t plan on following the new standards. The American Kennel Club responded by saying they have no plans to pressure the club into changing it’s mind. I’m not against all breeding. There are some breeders who are truly dedicated to the welfare and health of their animals. They do proper health screenings, get to know potential owners, and do not sell their dogs to pet stores or the highest bidder. They demonstrate a great knowledge of their breed and value their reputation for seeking ways to improve upon it. All breeds are susceptible to bad breeding practices, but the Bulldog is by far the most extreme example. The current breed standards for the Bulldog are well beyond what I would consider healthy. 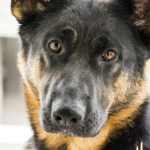 When we breed dogs for extreme traits to make them more marketable, despite the negative consequences to the dogs themselves, something has gone terribly wrong. It’s these extreme features that make the Bulldog so desirable for consumers, yet so detrimental to the breed itself. What’s been done to Bulldogs by bad breeding has had such a negative impact on the animals it defies common sense. We find the extreme look of the modern Bulldog desirable, yet we sacrificed their well-being to achieve it. Don’t support bad breeding practices by buying a Bulldog puppy from a breeder or pet store. If you’re considering getting a Bulldog please adopt one from a rescue or shelter. NYTimes – Can The Bulldog Be Saved? Great post and overview of what improper breeding practices can results in. We wrote about overweight Labs a few months ago – same issue – breeding to the extremes. It’s a real shame that these once beautiful healthy dogs are no longer healthy all in the name of ‘show’. It is such a shame; they’ve got such wonderful personalities and breeding for these extremes seems like such a careless way to make them more marketable. This is an amazing post. I have been thinking about bad breeding practices for the past few weeks, feeling a future blog post brewing. People don’t realize that this is not what bulldogs are meant to look like…they have been bred to look more “extreme”, and it really is terrible for the breed. I am sharing your post in the hopes that more people understand the importance of adoption when it comes to breeds like the bulldog. They used to be such athletic dogs, it really is a shame what’s been done to them over the years. It really seems to defy logic. When my Boston Terrior had to be put down (15years old). I was really interested in a bulldog due to their personality. However after researching the breed I soon realized that adding a bulldog to my family might be the wrong choice. This lead me to the Olde English Bulldogge. I purchased the puppy 15 months ago. He is an amazing dog. Their disposition is that of the English but they are really athletic, with none of the health issues. If your looking for a bulldog and I would look into the Olde English. You are so right I have two Old English Bull Doggies and they are very good dog,so far no health problems and they are very strong and athletic dogs,they get alone with other dogs and are not aggressive but if they feel danger they reacted,they are great with my Grandkids and are very good babysitters,they are also very slurred anything that comes with in100 yrds of my house I know it,if I had any cons it would be they can be alittle stubborn,Great Dogs. Great post & very well organized. I actually learned quite a bit here! I had no idea that that large of a percentage of bulldogs were born via C-section, but it makes sense. It’s really a shame what humans have done to great breeds. Sharing. Thank so much; it’s shameful the things we’ve done to make them more marketable. They really are such a great breed and now they suffer from such poor breeding choices. Let us not use kind words for those who breed dogs for show. I say the human is the most cruel of all animals on earth. ah wow. I didn’t realize these dogs have been changed so much! It is incredibly sad to see what has been done to many breeds in the way of sacrificing their welfare in the name of the “betterment of the breed.” Thank you so much for sharing this-more people need to be made aware! This was very interesting and I agree, shame on humans! It’s insane that people want to modify a breed just to make it more marketable. Will share this post! It really is so sad when it’s done for money rather than integrity. I’m pretty sure the Bulldog’s integrity was stripped away when they lost the ability to breed without human intervention, or at least that is when their big downfall began. A thoughtful and well-researched post – thank you for sharing! While, thankfully, I am not a product of irresponsible breeding, my older “sister” Emma the Boston Terrier was. She had several health issues, the most serious of which was anemia, which ultimately took her life. It is so important that people do research before they purchase a purebred dog: make sure you are purchasing from a responsible and reputable breeder. If you are at all unsure, adoption is always a great option! Thank you so much. Sorry to hear about Emma’s health problems; it’s always such heartache for us owners. Interesting! I actually never knew alot about bulldogs, I have a friend with one and know that she has had many many troubles with him as he is very high maintenance. cleaning face wrinkles daily, wiping messy bum, lots of medications and health issues. It’s such a shame how negatively impacted some breeds are like the Bulldog. I know some breeds have benefited over the years and are actually healthier, but that isn’t the case for all breeds. I wish us humans would put health concerns for the dog over how we think a breed should look. The Bulldog is the only breed I know of that can’t even reproduce without human intervention. When things go that far it’s time to take a look and see what we’ve done to these animals. It’s just so sad because every Bulldog I’ve met has a wonderful personality – so I completely understand the desire to own one. French bulldog cannot reproduce alone either – also requires C section births. Not sure what you mean by perfect personality – every bulldog I’ve met has been completely vacant and lacking personality – makes sense when you realize they’re concentrating on just breathing since it’s such a struggle for them. If they were bred to actually be able to breathe and run properly maybe I’d see more of that hidden personality you’re talking about. You know, that is kind of mean to ppl that own a BULLY with tons of PERSONALITY! I don’t know where the Bullies are you are meeting that are Vacant and lacking personality, but I would assume that has MORE to do with their owners b/c my 6 month old Bully breaths perfect And has the BEST personality ever! Please don’t say mean things about a dog that humans HAVE destroyed already! They are wonderful to be owned by and a very loving breed also! Until you OWN one, don’t knock them, they might SURPRISE YOU! Very well written post. The history bulldogs is fascinating, I didn’t realize it could be traced so far back. It would be interesting to find out if the breeding trend could be reversed in time. I do not personally know a bulldog, but the ones I’ve met in passing do indeed seem laid back and sweet. They seem “laid back” because they can barely breathe and cannot lose heat properly so don’t have the energy to be bouncy or excitable (that would require sufficient oxygen and a working cooling system), nor do they have the energy to be aggressive (fighting takes a lot of oxygen and makes a lot of heat too). My high energy, highly sensitive, nervous/ reactive herding mix is “laid back and sweet” after she’s had a 2 hour run / hike too. It doesn’t last of course because she can breathe and cool off properly and has a natural physical structure so after a couple of hours of rest she’s back to high energy whirling dervish. The truth is we don’t know what the bulldog’s true personality is like. It is hidden by their disabilities. When they are bred with longer muzzles and more athletic bodies perhaps their original temperament will come back too. It will be a very interesting experiment – I do hope we can get breeders to stop the torture breeding soon and make bulldogs look and move more like their original founder dogs. Not that I’d ever own one even then. I personally like herding breeds. This article is very incorrect when it states the American version of bulldog was used for herding – they never were. Catch dogs are not the same as herding dogs (catching and holding onto a cow by the nose is not herding it). If you are looking for a Bull Dog with all the abilities you just talk about look know further it is called the Old English Bull Doggie,in 1971 a man named David Levitz a breeder and a Veterinarian work very hard to come up with this breed it is 50 percent English Bull,1/6 Pitt Bull ,1/6 American Bull Dog and1/6 Bull Massive and they came up with a Great dog known as the Old English Bulldoggie.It has a awesome personality it can be alittle stubborn,it is a great family dog and will protect you and your family if needed,the Old English is not aggressive to other dogs or human and don’t have many health problems ,they want to please there owners and are usually easy to house train,I have two English Bull Doggies and they do not like me being mad at them,they have turned out to be great dogs. Great article, definitely rich with valuable information about bulldogs. Bulldogs are one of my favorite brachycephalic breeds. I love short nose dogs so much that I’ve also written an article about traveling with brachycephalic breeds. In the article, I talk about traveling domestic and internationally with brachycephalic dogs. I feel what your audience would gain great value from what they’ve read in your article, and gain additional information from reading my article as well! Here’s the link https://www.travelingpetsafety.com/snub-nosed-dogs/ if interested in reading. Again, awesome article! I look forward to reading more of your post. British Bulldogs are a recent breed and aren’t related to the old English bulldogs used in bull baiting, old English bulldogs are extinct as of the mid to late 19th century and British bulldogs didn’t exist until the mid 20th century and were bred as companion dogs not fighting dogs.